Custom Notebooks from Noted in Style, the notebook experts. Tell your brand story from cover to cover - and on all the pages in between. With custom notebooks, there are so many options we could fill a notebook listing them all! But we don’t work that way – telling you what the options are at the outset. We prefer to listen to what you want to achieve first and work with you from there. 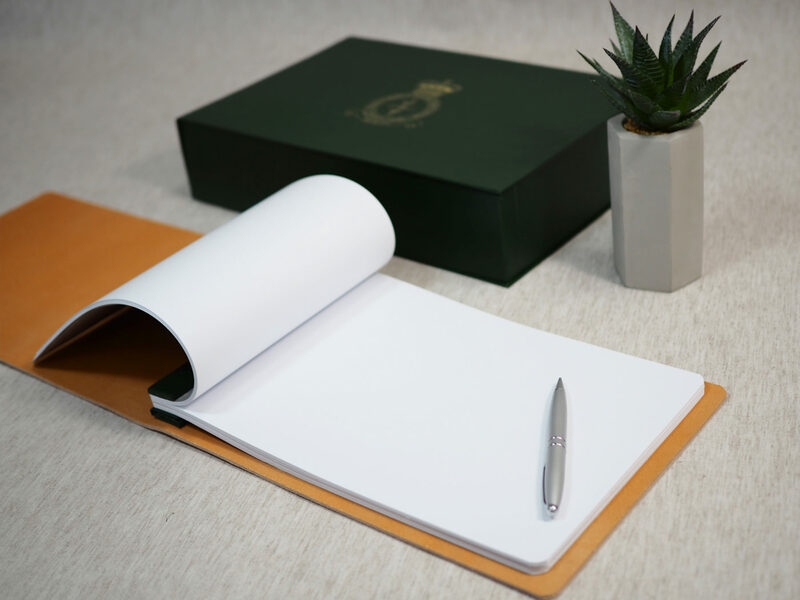 For staff onboarding to conference giveaways, thank you gifts to product launches, tell us what you want your custom notebooks to do for you and we’ll help you create the perfect product. With each of our teams (sales, design and production) under one roof, we can give you creative yet practical advice every step of the way. What’s Possible with a Custom Notebook? Size – do you want a standard A6, A5 or A4 size notebook, or do you need a very specific in-between size – we’ll need the measurements if you do. Cover material & branding – do you want a smooth, soft touch PU that changes colour when debossed, or are you looking for a faux leather or genuine leather, would a coloured paper fit the bill, or are you after something with a special look, such as mock croc or a metallic, or does the material to be Pantone matched for your brand colour? Do you need a foil print or Pantone screen print of your logo/artwork to the front or rear cover? Or perhaps you want to be able to flood the entire cover with a full-colour print? Endleaves & Internal pages – how many internal pages do you need? Tip – a page is one side of a leaf, so 200 pages equate to 100 leaves. Is your print going to be identical on every single page, or will it vary? Will your print one colour throughout (black or another colour?) or will you need some or all of the pages to be in full-colour print? If your book construction requires endleaves, are they to match the page paper or do you require them to be in colour – will there be print on the endleaves and if so one colour (which colour) or full colour? Finishing Touches – depending on the type of notebook being produced, you may want to consider: an elastic closure; a ribbon bookmark; a rear internal pocket; a pen loop; a coloured headband; edge painted pages. When considering all of the above, you’ll need to have the design and branding of your custom notebook in mind too. It’s important to ensure that all of the parts come together to make a beautiful whole; and that the overall look is consistent with your brand or current campaign. We can help you ensure this happens, as we have a knowledgeable sales and design team are on hand to advise you every step of the way – and you can trust us, as after all, notebooks are kind of our thing!